Want to have a heartfelt conversation with your bestie over cheesecake and coffee at a cafe sans the crowd? The Ganache at Bunglow 44 on Paud Road is just the place for you, serving an array of freshly baked pastries, gourmet sandwiches, pastas and more. Quaint and quiet, this lesser-known cafe is definitely a hidden gem at Kothrud, run single-handedly by the extremely talented chef and owner, Amit. The best part about Ganache is that there is no fixed menu. The specials go up on the blackboard, albeit some of the all-time favourites like the dark chocolate mousse, New York cheesecake and the Alfredo white sauce pasta always find their way on the board. We loved Amit’s gourmet pasta in marinara sauce with tomato, basil and olives for INR 150. Well-cooked and delicately plated, this dish is a burst of tangy-spicy flavours inside your mouth. We recommend you to try the high protein sandwich with coleslaw, roasted chicken chunks and ham for INR 110. 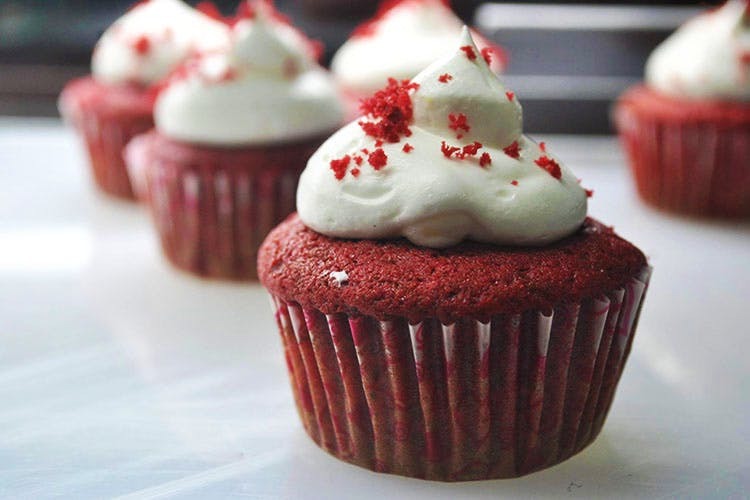 Dessert lovers, you cannot miss the special blueberry jam waffle for INR 100 and the delicious red velvet cupcake. The Ganache is not your usual cafe with waiters and fancy cartes. It’s all about minimalist decor with some great gourmet dishes. Amit is the only person who runs the cafe without any help whatsoever. So the service can be tad bit slow. However, we suggest you to strike a conversation with him as he works, enjoy your food and let us know about your experience.